Is Travis Kelce Gay ? Travis Kelce is an American football tight end for the Kansas City Chiefs of the National Football League (NFL), who signed a five-year contract extension worth $46 million on 29th January 2016. Travis ranked 91st on the NFL Top 100 Players of 2016. 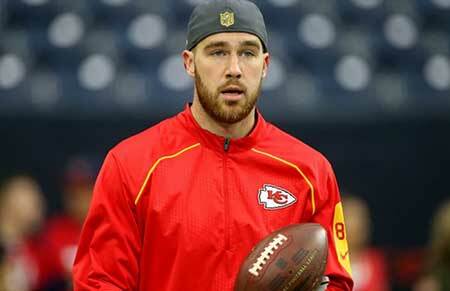 Travis Kelce was born on 5 October 1989 in Westlake, Ohio to the family of Ed Kelce and Donna Kelce. Kelce, who attended Cleveland Heights High School, played college football at the University of Cincinnati, a First-team All-Big East selection. Travis won College Football Performance Awards Tight End of the Year Award at Cincinnati. He was a three-year letter winner at quarterback for the Tigers. He was recognized with All-Lake Erie League honors for making 2,539 yards of total offense as a senior. He accepted a scholarship offered by the University of Cincinnati. He joined his brother Jason Kelce who is a center for the Philadelphia Eagles. Kelce was drafted by the Kansas City Chiefs in the 2013 NFL Draft. The Chiefs hired him with $3.12 million rookie contract for four years. He recorded his first professional touchdown on a 20-yard reception from quarterback Alex Smith against Miami Dolphins. He was fined $11,025 for his misconduct during the 29-16 loss to the Denver Broncos. In addition, he made an unprofessional hand gesture at the Broncos linebacker Von Miller. He initiated his first career multiple touchdown games against Houston in 2015. In January 2016, he signed a five-year extension contract of $46 million. He came at 91st position on the NFL Top 100 Players of 2016. He joined a new quarterback in Patrick Mahomes in the 2018 season. On 29th January 2016, E! Entertainment Television reported that Travis Kelce starring his dating show called "Catching Kelce". He ended dating contestant Maya Benberry but the couple broke up a few months later. In 2015, Travis started 16 regular-season games and recorded 72 catches for 875 yards and five touchdowns, earning his way to his first Pro Bowl. Kelce has an estimated net worth of about $12 million as of 2019. Five months after breaking up with girlfriend Maya Benberry, Kelce dated gorgeous lady named Kayla Nicole. While attending the wedding ceremony of his teammate Jeremy Maclin, he posted an Instagram image with the gorgeous model. The couple has been going so strong in their relationship for more than a year. My lil baby turned another year older this month! The future is gonna bring you so many amazing things, I can’t wait to see you blossom! And for the times life gets a little out of control just know I gotchu in my arms making sure you’re always good!! Kelce celebrated Nicole's birthday with a sweet Instagram post back on 11 November 2018.